<b>Here is theÂ ultimateÂ resource for anyone looking to improve cardiac health and lose weight, offering 800 recipesâ€”100 all new, 150 refreshedâ€”that cut saturated fat and cholesterol. </b><br /><br />The American Heart Association's cornerstone cookbook has sold more than three million copies and it's now fully updated and expanded to reflect the association's latest guidelines as well as current tastes, with a fresh focus on quick and easy. This invaluable, one-stop-shoppingÂ resourceâ€”including updated heart-health information, strategies and tips for meal planning, shopping, and cooking healthfullyâ€”by the most recognized and respected name in heart health is certain to become a staple in American kitchens. These days, a trip to the grocery store requires a little soul-searching and a lot of label reading: organic, sustainable, local, seasonal, low-carb, low-cal, gluten-free, sugar-free, GMO-free, vegan, vegetarian, raw, and Paleo. When did eating become so fussy? Itâ€™s enough to make you throw your hands in the air--and then right inside the fridge for some pie.<br /><br />Eating healthy nowadays really just means eating clean, or choosing whole foods sourced from the earth with the least processing and fewest possible ingredients that sound like hair dye. Eating clean is not about counting calories or grams of carbs, or getting tricked by â€œhealth foodâ€� imposters, so you wonâ€™t find any of that here. Real food is the science-backed way to good health and a better body.<br /><br />Yet eating clean day after day isnâ€™t so easy. 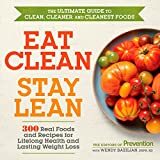 Thatâ€™s why the editors at <i>Prevention</i> created <i>Eat Clean, Stay Lean</i>--your easy-to-use, visual guidebook to better health, delicious food, and a slimmer you. Learn how to make 50 smarter choices in the supermarket and 150 cleaner, fast meals at home, all of which can help you lose weight while you enjoy real food that tastes great--and it even includes real pie.